Moving on now to a band that traverse multiple sub-genres within their black metal. 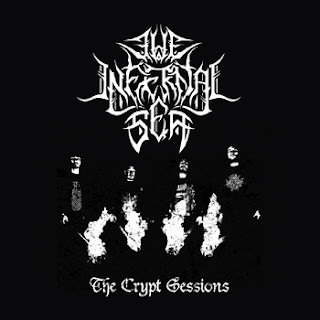 The Infernal Sea began their journey in 2009, before releasing their debut album Call of The Augur in 2012. Earlier this year, they released The Crypt Sessions EP, which features three tracks of death infused black metal, recorded live at The Crypt rehearsal space/studios. They've shared stages with everyone from Napalm Death to 1349 to Annotations of An Autopsy and the experience they gained playing at this years Bloodstock festival will no doubt help them as they begin to write and record their 2nd full length later this year. There's something above live recordings that bring out the essence of a band. Okay, proper live recordings can sound a bit weak, but if they're done in a studio like the songs recorded for The Crypt Sessions, they can sound furious. That's exactly what happens with The Infernal Sea. Their sound is pretty terrifying; especially in the vocal department and opener Skinwalker is the perfect way to kick things off. The guitars have that buzzsaw sound and the drums, while dominated by the crashing cymbals feature some killer kick drumming. The Circle Closes manages to sound rawer some how. Initially it doesn't sound as urgent as Skinwalker did, but there's a higher level of technicality and progression in the song, with different soundscapes and time signatures being used. The rasping vocals finish off the song beautifully and keep that ice-cold atmosphere well and truly in place. Into The Unknown is literally that. It's a fifteen-minute slab of nasty black metal with ambient instrumentation and subtle underlying melody. It's hellishly good from the moment it starts to the moment it ends. It shows that The Infernal Sea have the chops to be as grandiose as they want, without pandering to what others want. There's a hint of bands like Deathspell Omega and Blut Aus Nord to their sound, certainly in the case of the progression they weave into the music. About seven minutes in the song descends into noisy chaos. It's the kind of noise that would drive you insane, if it was unleashed during a gig, as it swirls around your ears with howls, guitar feedback and wildly intense drums. Some melody can be heard within, though sparse. It's reigns throughout the rest of song, winding its way to quiet end. It may only span three tracks, but those three tracks last over twenty-five minutes and show The Infernal Sea in a great light. They may frequent a different end to the black spectrum than Nordland did in my previous review, but like Nordland they have their own sound and their own maturity. They have a split seven inch on the way and they're in the process of writing a new record, so the second half of this year and 2014 could be very busy indeed.